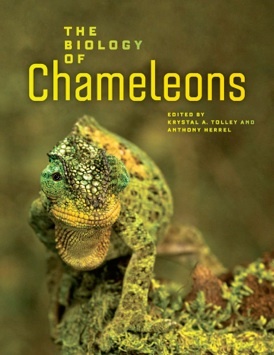 The Biology of Chameleons should now be considered the authoritative text on our knowledge of chameleons. This is the most comprehensive text on the subject, pulling from hundreds of scientific articles, studies, and field work like no other text has before it. The book has 10 main sections incorporating an extensive array of topics: Anatomy, Physiology, Function and Adaptation, Ecology and Life History, Behavior and Color Change, Evolution and Biogeography, Overview of the Systematics of Chamaeleonidae, Fossil History, and Conservation. While written in the style of a reference book with few pictures, it is still accessible for casual enthusiasts in addition to serious students and professionals. The anatomy sections are really the first of their kind in this depth and an excellent resource. The included visual aids such as the diagrams of the skull and internal ear structures are particularly helpful. Previously, these descriptions were only found in scientific articles and had to be pieced together from various studies. Muscular, skeletal, digestive and other major body systems are also described, although without accompanying diagrams. The need for more specific and extensive research on chameleon anatomy is recognized but this is a great step in publishing a total body anatomy study. The physiology section is quite brief but acknowledges studies by multiple authors on a variety of topics for further reading if a particular section is of interest. I would have liked to see some of these topics expanded in more depth, however there is still much that we do not know about chameleon physiology. Function and Adaptation has an extensive focus on the feeding mechanism and locomotion with some of the latest research results presented. As these are some of the more fascinating characteristics of chameleons it is a welcome addition to our understanding. The Ecology and Behavior sections are thorough without getting bogged down in details. While the description on the color changing mechanisms is found in other books, it is still a welcome addition as it is admittedly one of the most well known capabilities of chameleons. Taxonomy is a daunting topic with nearly 200 known species spread across several continents but here it is represented with current updates in a comprehensive breakdown. Data from the fossil records demonstrating genetic drift is one example of the comprehensive nature of this text. Each of the genera is summarized with the defining characteristics of that genus along with some of the species best explemifying those traits. These sections are complicated with extensive scientific vernacular making it a bit of a dry read, however the information is very valuable for a better understanding of the evolutionary diversity of chameleons. Conservation is one of the most important topics to preserving these fascinating animals for future generations, and this section paints a stark though realistic picture of how quickly they are disappearing. The current efforts of CITES (Convention on International Trade in Endangered Species) and IUCN (International Union for Conservation of Nature) are the most important steps to preservation and are summarized here along with historic trends of exportation. Understanding the current situation is the first step in better understanding how to appropriately address future conservation efforts. A text with such an in-depth investigation of ecology and biology is a wonderful resource for the study and understanding of chameleons. I would consider this book a must-have for chameleon resource libraries. While some books have sections on the native environments and ecology of specific species, it is refreshing to see so many advanced topics explored in greater breadth. I will caution that there are no sections on captive care or husbandry in this text, so if that is the goal of your literature search you should consider one of the many other books that cover those areas. 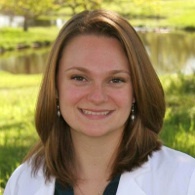 Dayna Willems DVM is a veterinarian with a special interest in reptiles and exotics practicing in Denver Colorado. She has been fascinated with reptiles ever since she was a little girl and has always had a varied collection of reptiles and exotic pets. Some of Dayna's turtles were obtained when she was in elementary school and are still around today. Dayna takes great efforts to promote education and improving captive conditions for reptiles through work and personal efforts. When not taking care of the animal family she enjoys taking advantage of the beautiful Colorado scenery with hiking, camping, and skiing with her dogs and wonderful husband.